It is always interesting when a one-country holiday becomes a two-country holiday. When two of us were in Rome last year, we crossed in and out of the Vatican City, which is recognised internationally as a sovereign independent state, despite in its size and population. 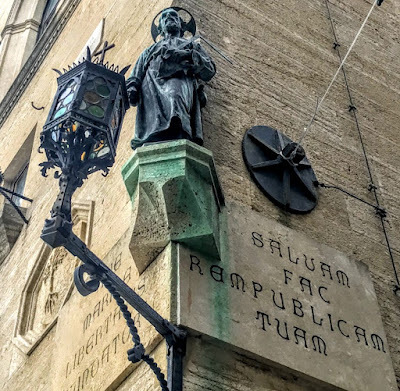 San Marino, officially the Republic of San Marino (Repubblica di San Marino), or the Most Serene Republic of San Marino (Serenissima Repubblica di San Marino), is a microstate that is an enclave, and it too is totally surrounded by Italy. 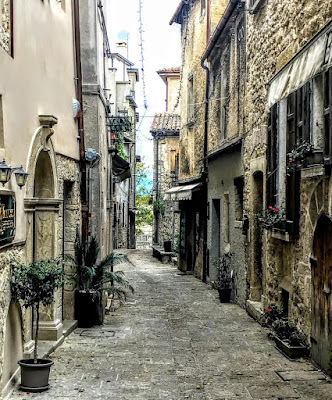 Late last year, two of us caught an early morning train from Bologna to Rimini, and by mid-morning we were on the side of the Apennine Mountains, on top of Monte Titano in San Marino. Today, San Marino is the only surviving Italian microstate. Like Andorra, Liechtenstein and Monaco, it is an anachronism and a reminder of the time when Europe – particularly Germany, Italy and the Pyrenees – was made up of tiny political units, sometimes extending no further than a cannon could fire from a city’s walls. 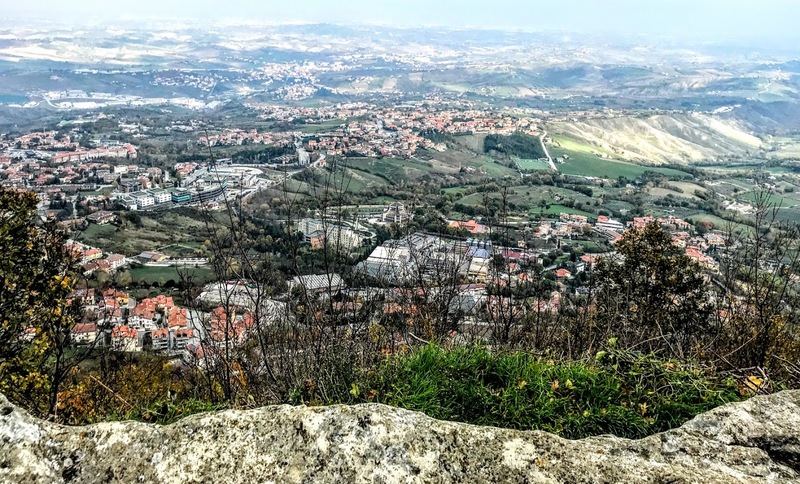 San Marino’s territory is about 61 sq km (24 sq miles), and it has a population of 33,562, including 4,800 foreign residents, mostly Italian citizens. It has the smallest population in Europe, and in size it is the third smallest country in Europe – only the Vatican City and Monaco are smaller. It is the world’s smallest republic and fifth smallest country. San Marino takes its name from Saint Marinus, who left the Dalmatian island of Arba in present-day Croatia with his lifelong friend Leo. They settled in Rimini, where he worked as a stonemason and was ordained a deacon. During the persecutions in the reign of the Emperor Diocletian, Saint Marinus fled from Rimini to the slopes of Monte Titano. There he built a small church and is said to have founded the ‘Titanic Republic’ or San Marino on 3 September 301. The independence of San Marino was recognised by the Papacy in 1631. Napoleon’s advance in 1797 presented a brief threat to the independence, but Napoleon eventually promised to guarantee and protect the independence of the Republic, even offering to extend its territory. After the Napoleonic Wars, the independence of San Marino was recognised in international law at the Congress of Vienna in 1815. During the Italian War of Unification, San Marino became a place of refuge, and Garibaldi accepted its wish not to be incorporated into the new Italian state in 1862. During World War I, when Italy declared war on Habsburg Austria in 1915, San Marino’s neutrality gave rise to hostile Italian suspicions that it could harbour Austrian spies, while the presence of volunteers from San Marino in an Italian medical corps running a Red Cross field hospital led Austria to suspend diplomatic relations. 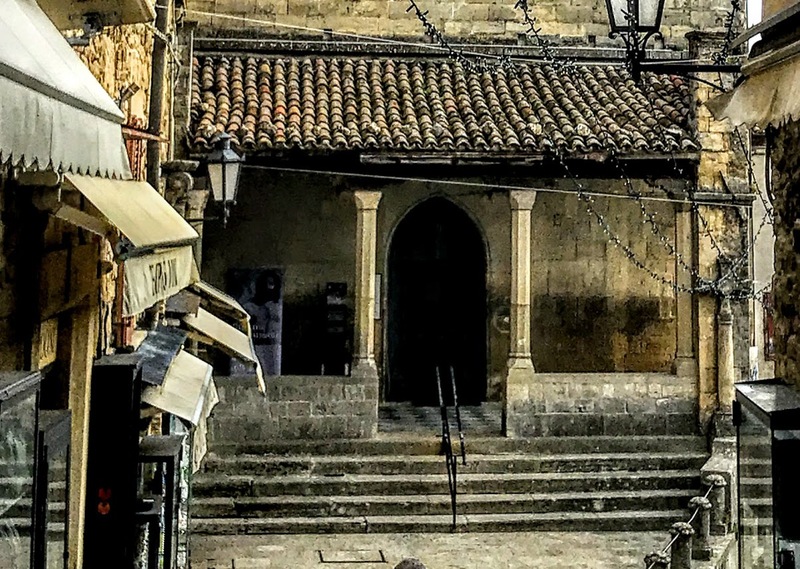 San Marino had a fascist government in 1923-1943, but it remained neutral in World War II and provided a safe harbour for more than 100,000 Italians, including many Jews, fleeing Nazi and Italian persecution. The fascist government collapsed three days after the fall of Mussolini, but when it regained power in 1944 it maintained neutrality intact. In September 1944, it was briefly occupied by German forces, but they were soon defeated by Allied forces. 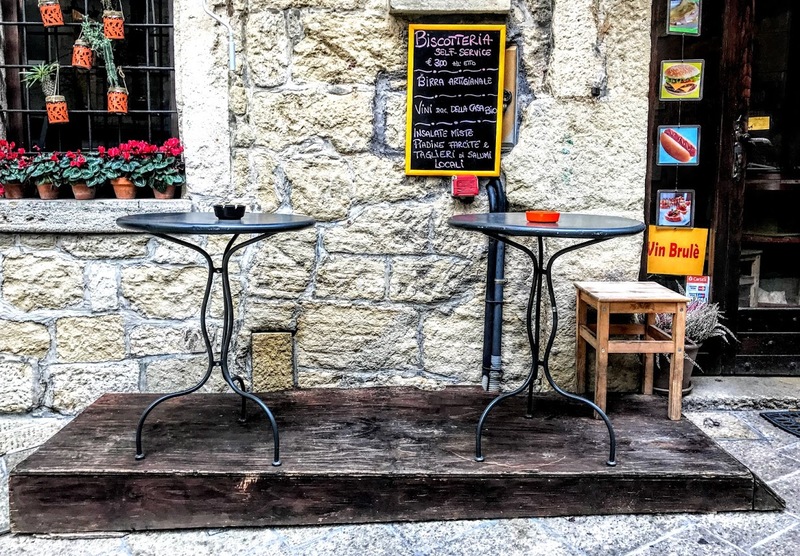 Although San Marino is not an EU member state, an arrangement with the EU allows it to use the Euro as its currency and to use its own designs on the national side of Euro coins. But the small number of these coins means they are primarily of interest to coin collectors. As a schoolboy, I thought San Marino existed mainly on the revenue from selling collectable postage stamps. 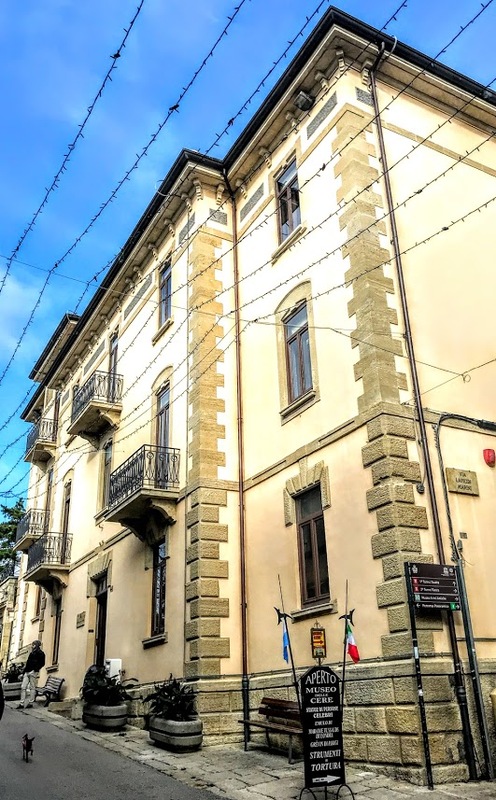 But, in reality, the economy of San Marino relies mainly on finance, industry, services and tourism, making it one of the wealthiest countries in the world in terms of GDP per capita, with a figure comparable to the most developed European regions. The capital is the City of San Marino and the largest urban area is Serravalle. San Marino has a highly stable economy, with one of the lowest unemployment rates in Europe, no national debt and a budget surplus. It is said to be the only country where there are more vehicles than people. Although San Marino has a basilica on the Piazza Domus Plebis, this is not a cathedral, and there is no episcopal see in San Marino. 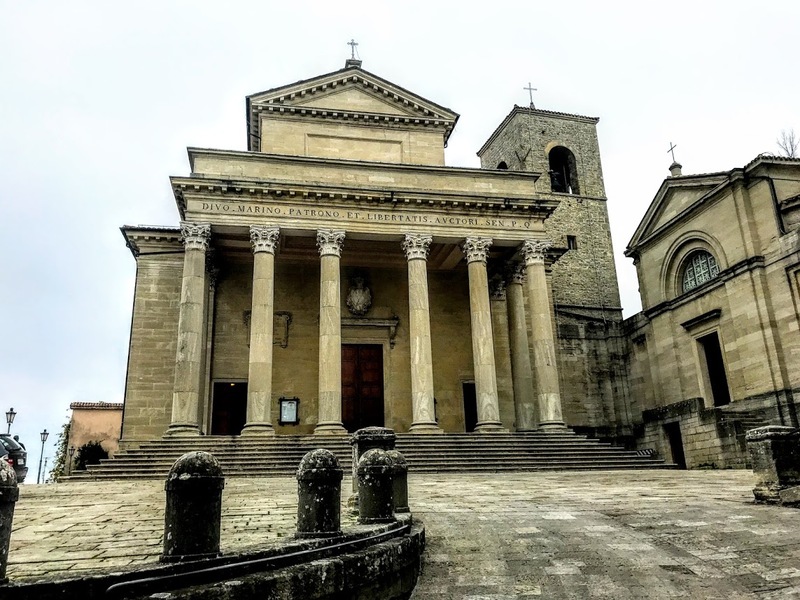 The whole country is a small part of the Italian Diocese of Montefeltro-San Marino, and the bishop lives in Pennabilli. The Church of Saint Francis, founded in 1361 by the Conventual Franciscans, is the oldest church in San Marino. 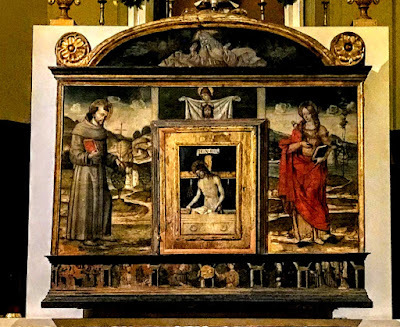 The church has a wooden crucifix dating from the 14th century and frescoes by Antonio Alberti da Ferrara dating from the early 15th century. 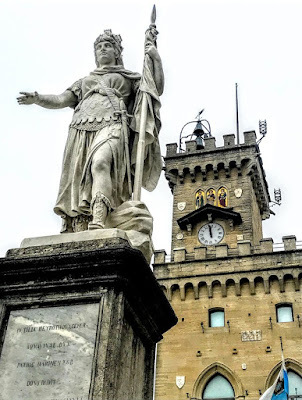 Today, it is said, more than 97 per cent of the people are Roman Catholic, but there is no state religion and there is a tiny Waldensian and Jewish presence. 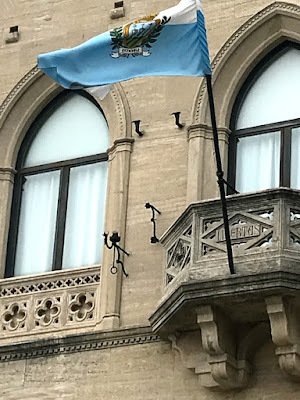 San Marino is a multiparty democracy, and the Captains Regent are both heads of state and heads of governments. The 60-member elected parliament is known as the Grand and General Council, and there is an independent judiciary. 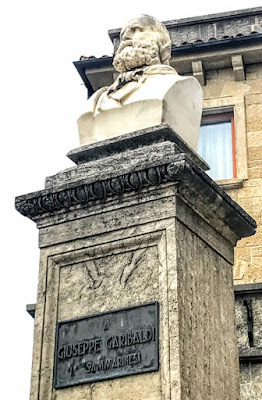 In the past, San Marino was ruled by the Arengo, chosen from among the heads of each family. In the 13th century, power was handed over to the Grand and General Council, and the first two Captains Regent were nominated by the council in 1243. 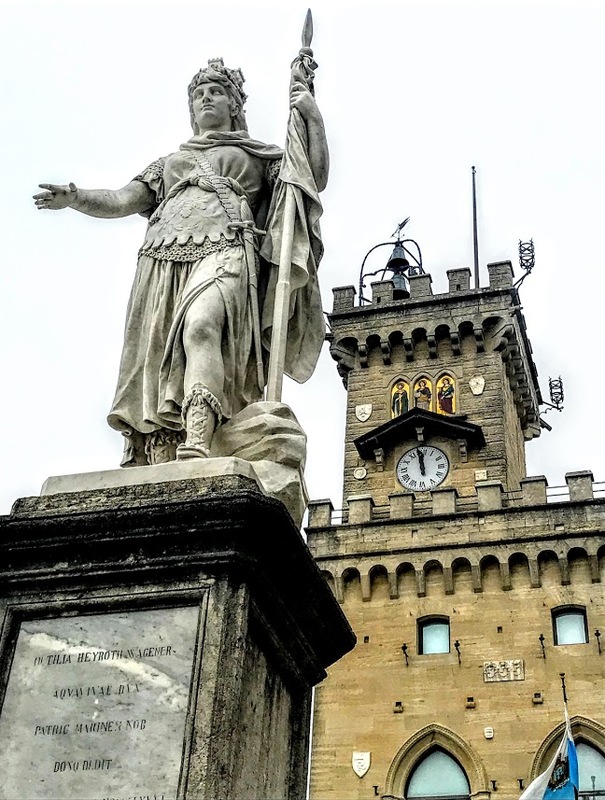 San Marino claims to have had more female heads of state than any other country. Twice a year, on 1 April and 1 October, the council elects two Captains Regent as the heads of state, holding office for a six-month term. This system of two heads of state is said to be modelled on the Roman consuls in the Roman Republic, and the Council is the equivalent of the Roman Senate. The present Captains Regent are Enrico Carattoni and Matteo Fiorini. San Marino’s military forces are among the smallest in the world. National defence is, by arrangement, the responsibility of Italy’s armed forces. Different branches have varied functions, including performing ceremonial duties, patrolling borders; mounting guard at government buildings, and assisting police in major criminal cases. They include the exotically-named Crossbow Corps, the Guard of the Rock, the Guard of the Grand and General Council, known locally as the Guard of the Nobles, the Company of Unformed Militia, the Military Ensemble, which is a ceremonial military band of about 50 musicians, and the Gendarmerie. In addition, there is a modern police force. 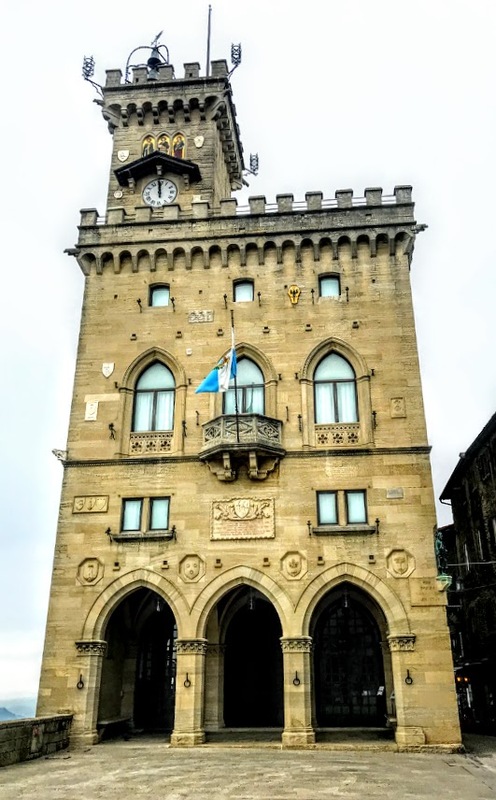 San Marino has been a member of the United Nations, since 1992, it has its own university, postal systems, banks and car registration numbers, and its own national football team. However, the San Marino Grand Prix never took place there: it was staged at Imola, about 100 km north of San Marino, but was removed from the international calendar in 2007. 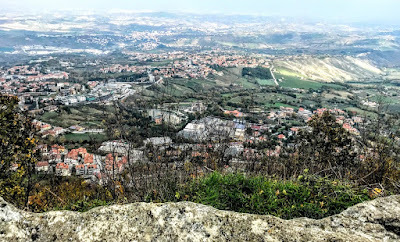 San Marino has 220 km of roads, but public transport facilities are limited. There is no airport and no rail links to nearby Italian towns and cities. 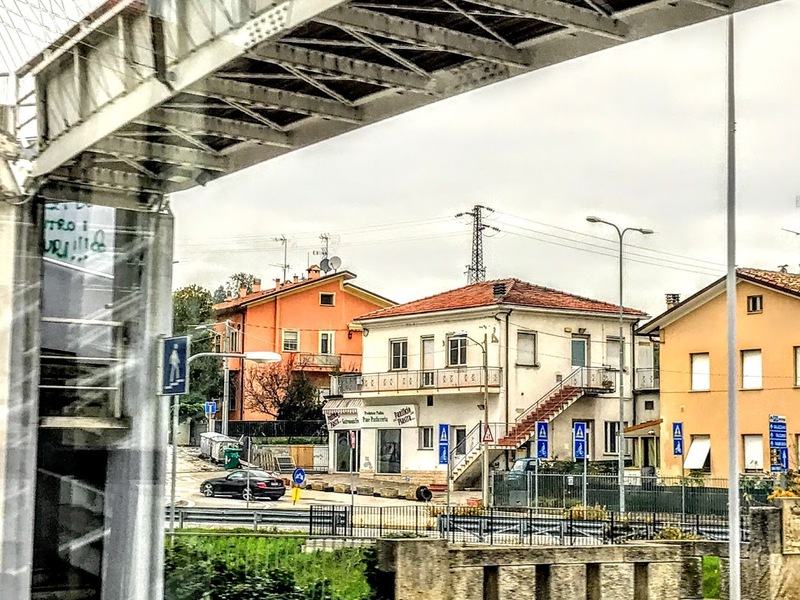 But there is a regular bus service between Rimini and the city of San Marino that is popular with both tourists and workers commuting to San Marino from surrounding Italy. The bus stops at about 20 places in Rimini and inside San Marino on the journey between the train station in Rimini and the bus station in San Marino. A 1.5 km cable car also connects Borgo Maggiore at the bottom of Monte Titano and the City of San Marino at the top of the rocky mountain. But the cable car was not running this when I visited San Marino. Perhaps because the tourist season was over, it was a good opportunity for an overhaul. The tourist office beside the cable car terminal offers €5 tourist visas. A visa costs as much as the bus journey from Rimini, and it is not necessary. Should I have got my passport stamped? I certainly did not need a visa. 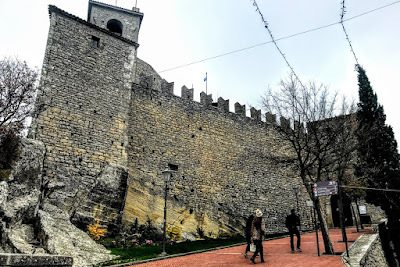 San Marino has an open border with Italy, there were no checkpoints as the bus crosses the border, not just once but twice on each leg of the journey, and before I even reached the tourist office I had travelled along most of the roads through this tiny republic, and walked most of the streets of the old town. Very few countries these days bother to stamp my passport, even when they demand to see it. Switzerland is outside the EU but has never stamped my passport. 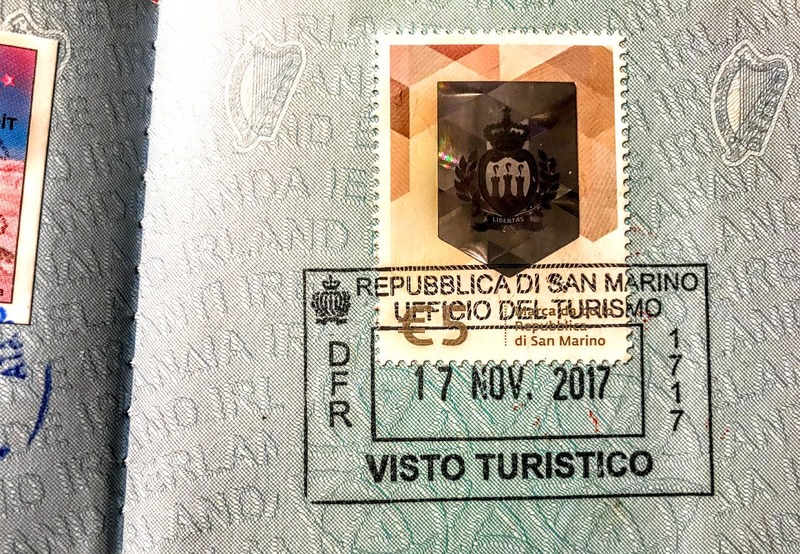 I have walked in and out of the Vatican City and through Saint Peter’s Square on many occasions … but no-one ever asked for my passport as I stepped in from Italy, let alone offer to stamp it. Britain may soon leave the EU, so I may be confused about which queue to join at an airport; but are they are going to reintroduce passport stamps for EU citizens queuing at airports? The only European country that bothers to stamp my passport these days is Turkey, and that is probably because it earns a hefty amount of foreign currency by charging tourists for visas. A heavily-stamped passport is a rarity for EU citizens these days, even those of us who think we are well-travelled. The only other stamps on my present passport are from a visit to the US many years ago. Of course, it could be costly filling a passport too quickly. At one stage in the 1990s, while I was working as a journalist, I had to apply for – and pay for – a second passport. 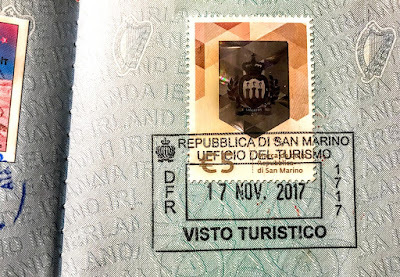 My latest stamp in San Marino says goodbye to another visa page in my passport – five gone, 23 to go. I am sure, however, this one is going to last until it’s due for renewal later this year. Afterwards, we had lunch at La Capanna, a restaurant looking over the rocks of San Marino and out to the Adriatic coast of Italy. The view was worth it, whatever about the visa. This feature was first published in the ‘Church Review’ (Dublin and Glendalough) and the ‘Diocesan Magazine’ (Cashel, Ferns and Ossory) in March 2018. 9.30 a.m., The Parish Eucharist (Holy Communion), Saint Mary’s Church, Askeaton, Co Limerick. Do you have problems with prayer, with praying? It can be difficult, and difficult for priests too. When we are ordained as priests, we are told in the Ordinal that we are to lead God’s people in prayer (Book of Common Prayer, p 565), but we are also charged by the bishop to be diligent in prayer, in the reading of Scripture and in study (p 566). But being told to do something, and actually doing it, are two very different things. So, to guide myself in prayer each morning in Lent, I am being guided by three sets of the Stations of the Cross. I am taking one image each morning in Lent from three sets of 14 sets of stations that I have photographed in Longford, Millstreet and Lichfield, meditating on that image, praying, and trying to travel with Christ through Lent to the Crucifixion on Good Friday and the Resurrection on Easter Day. There are times when prayer is not easy, and so these images, meditations and prayers at the beginning of each day, hopefully, help to shape each day in Lent that is grounded and rooted in prayer. But prayer can often difficult for every one of us, and it is easy to be distracted. Because the Church knew at an early stage that prayer could be difficult for all of us some of the time, and for some of us all the time, early and mediaeval churches were decorated to take account of our distractions, to catch us unaware of our distractions, and to bring us back to the reasons we find ourselves in church. We can be distracted on a Sunday morning by the presence of other people, by thoughts that bring us back to the problems of the past week, by worries and anxieties about the coming week, by the snow outside, by noises outside the church, even by noises and people inside the church. When we are distracted in prayer, we stop listening to God. But, frankly, one of the big distractions in prayer can be the feeling that God is not listening to us. And the same thing can happen when we try to pray at home, in the privacy of our own homes or rooms. In the past, many churches were decorated with frescoes and icons. 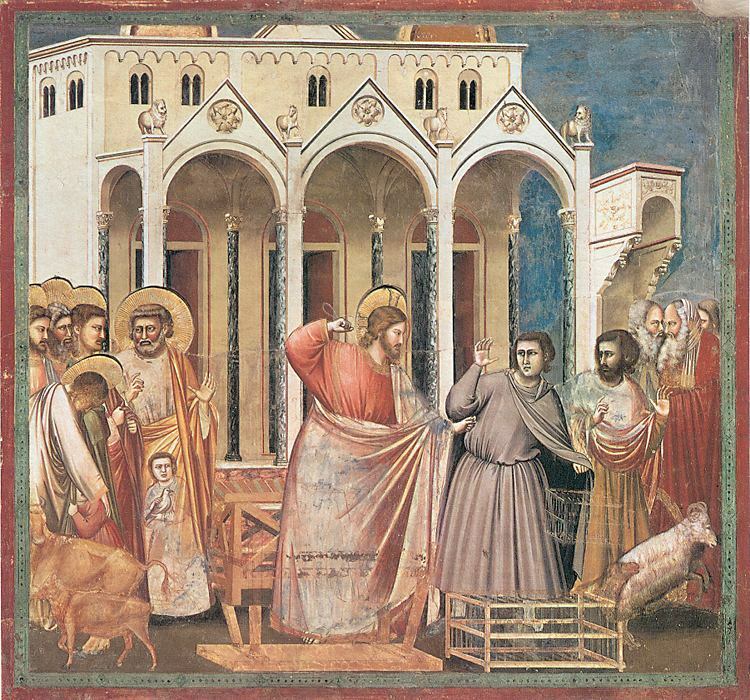 Many Reformers objected to this as idolatry, and wanted to remove some, sometimes even all images from churches. But the inspiration for those early church decorators was to call people back to prayer and the Bible, and to lift up their hearts and minds to God. The bottom, ground level of the frescoes in a church were of earthly scenes. As our eyes moved up, we moved through the stories of saints, prophets and martyrs, through New Testament scenes, to events in the life of Christ, and finally, in the dome to Christ enthroned in splendour, as the Pantocrator or ruler of all, surrounded by the heavenly host of angels and the four evangelists. Once, as I was a preparing for a seminar with students, I asked my sons when they were still children to close their eyes, to think of a church they knew, and to say what was the first thing they would see when they walked in. One said, ‘The backs of people.’ It said a lot about how children can find some churches cold and unwelcoming. I thought he was pulling my leg and that he knew the reason for my little exercise. But, no, he reminded me of how he held my hand as a little child as we walked into a dark church in a small village on a Greek island. And he told me how in the darkness his eyes were drawn up to the light streaming through the small windows in the dome, and he was startled by the image of Christ, lit up by the rays of sunshine and looking down lovingly on the two of us, father and son. Oh, that everyone who came into our churches could say that the first thing they see is Jesus, rather than the backs of people. 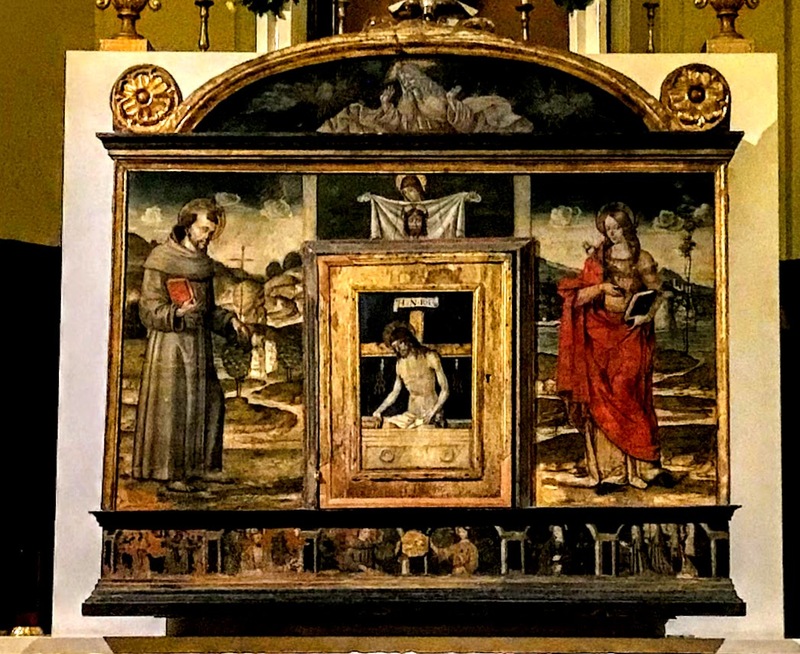 Historically, Anglicans tried to undo the iconoclasm of over-zealous, small-minded reformers by providing a visual focus for us when our minds wander during prayer. This could be in stained glass windows or in a large painting behind or above the altar. One traditional Anglican way of catching the eyes of the distracted was to place a number of boards in the chancel area, two decorated with the Ten Commandments, as we have heard them in our Old Testament reading this morning (Exodus 20: 1-17), and one on each side of these, with the Lord’s Prayer and the Apostles’ Creed. These boards recognised that we can be bored by sermons and distracted in prayer. But they allowed people to learn the Ten Commandments, the Lord’s Prayer and the Creed, and so to learn to pray and to grow in faith and discipleship. And they allowed us to bring our focus back to why we were in church and to return to prayer. Many of these boards survive in the Wren churches throughout London, and I know of at least two in Ireland: Kenure Church in Rush, north Co Dublin, and Saint Carthage’s Cathedral in Lismore, Co Waterford. The frescoes, icons and Stations of the Cross in other churches serve the same purpose. They are positive distractions when our minds and our eyes are tempted to wander in prayer and in worship. But there are negative distractions too. Do not get me wrong, please. I never children a distraction in church. Children should be as comfortable in church on a Sunday morning as they ought to be in their grannies’ on a Sunday afternoon. But there are negative distractions that take our eyes and our minds away from where they should be on Sunday morning: what’s happening around us; the sounds outside. The first hit for the Saw Doctors was a song with a crude description of how a young man is distracted by the female form at Sunday Mass. But it was ever so. I cannot imagine that the only conversation that Mary and Joseph had when they brought the Child Jesus to the Temple was holy talk with Simeon and Anna. In the Temple in Jerusalem, when they came together on high holy days and holidays, such as the Passover scene in this morning’s Gospel reading, of course they stopped and joked and chatted, and consoled and congratulated one another as they caught up on the latest news. It was building up community, the family of God. In the Church today, our social chit-chat, before and after, is not just mere gossip or a distraction, but builds up the Body of Christ. This is positive distraction. But in our Gospel reading this morning, Christ is dealing with negative distractions, a whole package, a whole collection of negative distractions. The Ten Commandments are the summary of our relationships with God and with one another. They summarise the purpose and direction of worship and prayer, and they summarise and express the core values of community relations. Christ’s action in our Gospel reading is a reaction to how those values have been abused and set aside for personal gain in a place that is supposed to be at the heart of these relationships. In the outer court of the Temple, he finds a thriving market, where visitors can buy the animals needed for sacrifice and change coins with images of Caesar as a god for coins that are acceptable as Temple tax. He must have known that Mary and Joseph had to change coins and to buy their turtle doves when they brought him in their arms to the Temple. Jeremiah had said that impurity would destroy the value of the Temple in God’s eyes, and it would ‘become a den of robbers’ in his sight (Jeremiah 7: 11). All classes of people, indeed all the nations of the earth, should be able to worship God, the prophets had declared, so that ‘there shall no longer be traders in the house of the Lord’ (see Zechariah 14: 21; Isaiah 56: 7; Tobit 14: 5-7). Christ’s action this morning is not a mere outburst of temper, but the energy of righteousness being used to confront people whose business and sharp practice have become distractions from prayer and worship. It is not those who are praying, or those who are distracted from prayer, that he wants to hear what he has to say, but those who have no time for prayer at all and instead are there to make quick profits out of money changing and large profits out of selling animals that distracts or even deters those who should feel welcome to worship of God, and to meet one another. For the love of God and the love of others is the summary of the law of Moses. The disciples are reminded, ‘Zeal for your house will consume me’ (see Psalm 69: 9). But this rebuke is heard and interpreted only in material ways. 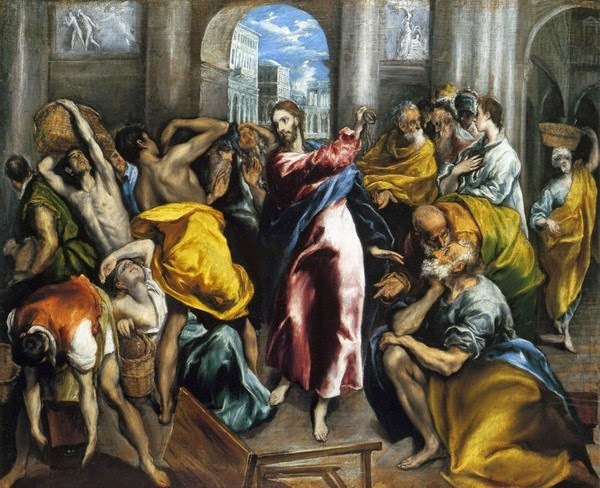 Those around him are so distracted from their prayers that they cannot grasp that the true, lasting Temple is the body of Christ which, as the disciples would see after the Resurrection, would be raised up in three days. Hopefully, we shall continue to see this as we journey with Christ through Lent this year. This sermon was prepared for Sunday 4 March 2018, the Third Sunday in Lent. 645, Father, hear the prayers we offer. 330, God is here! As we his people. This is the Third Sunday in Lent [4 March 2018]. Later this morning, I am presiding and preaching at the Parish Eucharist (Holy Communion) in Saint Mary’s Church, Askeaton at 9.30 a.m., but weather conditions, including the heavy snow and high winds that have swept across Ireland, means that a decision was taken on Friday to cancel Morning Prayer in Saint Brendan’s Church, Kilnaughtin, Tarbert, Co Kerry, at 11.30 a.m., and I have also cancelled a planned visit to Warsaw in Poland. In this second station by Liam Cosgrave in Millstreet, Christ stands alone in the city street as he holds the cross on his shoulder, his two hands beginning to grip one arm of the cross. Tomorrow: Station 3: Jesus falls the first time.